Fact: we are all going to die someday. National Healthcare Decision Day educates and motivates people and healthcare providers to talk about advance care planning. 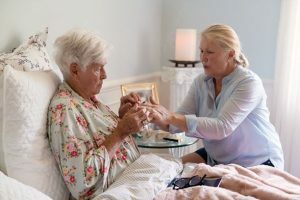 Advance care planning can include living wills, hospice and palliative care, treatment plans if diagnosed with an illness, individual values to emphasize in care and treatment and even options if the individual is unable to speak. For many, advance care planning can be a difficult conversation to start. Nearly 21 percent of people don’t have the conversation because they don’t want to upset their loved one. However, 92 percent of people understand the importance of having a conversation in order to best provide for their loved one’s decisions and wishes. National Healthcare Decision Day hopes to alleviate the stigma and uneasy feelings by hosting events around the country. On April 16, Memorial Center for Learning and Innovation and Memorial Home Hospice will host a free documentary screening which portrays end-of-life decision-making process with patients and their healthcare providers. The 40-minute Oscar-nominated documentary will conclude with a discussion on advance care planning initiatives available to the public. The showing is open to the public and additional information about the event can be found here. Caregivers are encouraged to attend with their loved ones as an opportunity to start advance care planning discussions about hospice or palliative care. If you’re unable to attend the documentary screening, The Conversation Project has created a four-step guide on how to start the conversation with your loved one so that you can learn their wishes.